The “Magnat-Debon” company was established by Joseph Magnat and Louis Debon in Grenoble, France. In 1893, it started producing bicycles. During WWI it becomes very successful: motorcycles benefit from new technology, such as telescopic shock-absorbers and air valves. In 1922, “Magnat-Debon” was taken over by “Terot” enterprise. 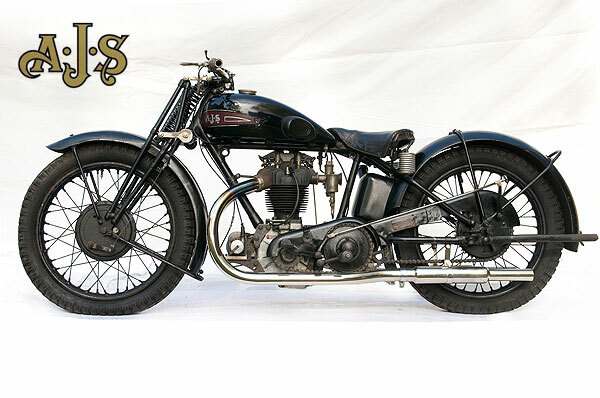 AJS, one of the most prestigious British motorcycle brands, began production when Joe Stevens and sons began building motorcycles. 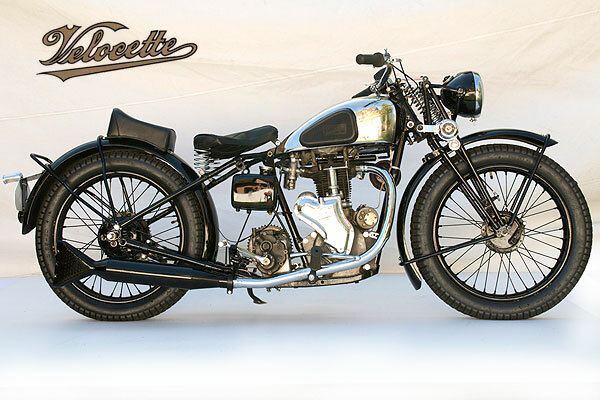 In 1909, brothers Stevens produced their first motorcycle with 289 ccm side valve engine. Their first success was in 1914, when they won the Island of Man race. The abreviation AJS stands for the initials of the brothers’ names: Albert, John, and Steven. 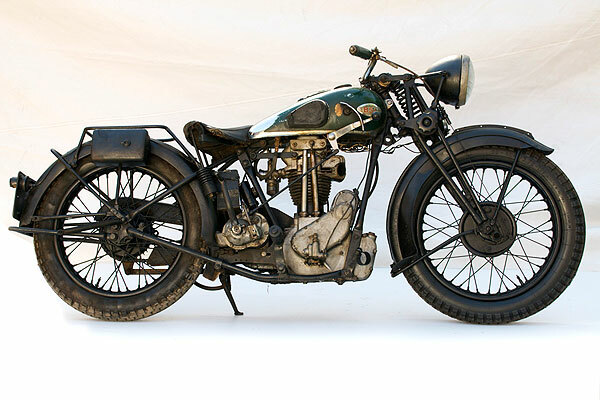 The BSA (Birmingham Small Arms Company) was the largest and most successful British motorcycle manufacturer. 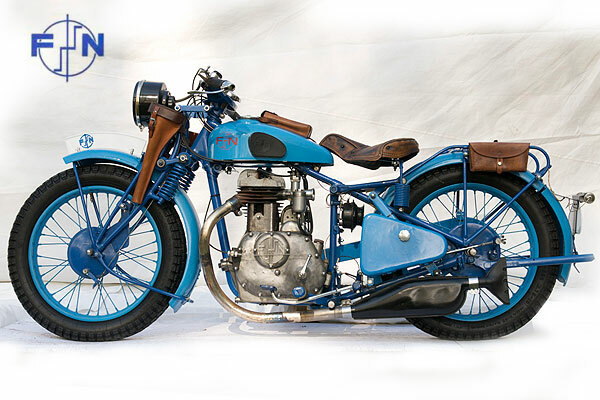 In 1940, it began production of its famous Star – Series powered by Blue Star single-cylinder 255 ccm, 350 ccm and 500 ccm engines. This was a cross-breed between the sport and an all around motorcycle model. It became very popular because of its easy handling compared with other British motorcycles, as well as its low noise level, safety, and high gas mileage. F/N (Fabrique National) was a pioneer in motor block production. It was world-renowned as the “Winner of Sahara.” The April, 1931, issue of the magazine “Motor,” reported that, “The Sahara experience has convinced it (the F/N) to stick with the closed engine and transmission assembly in one block, with a gear-drive transfer from the engine to transmission. This is a light-weight German motorcycle, economical and easy to handle. 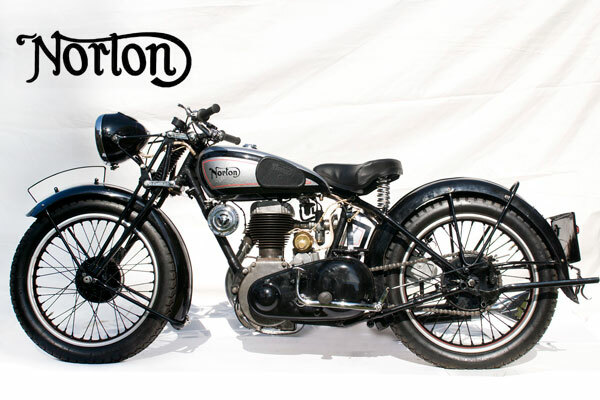 Norton, the British motorcycle company, was established in 1898. 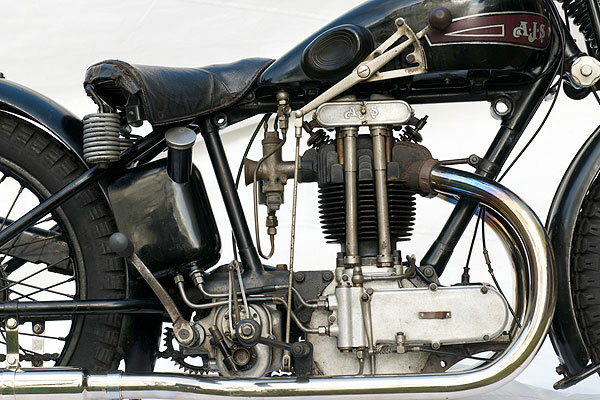 In 1902, it began to produce motorcycles for French and Swiss engine manufacturers. 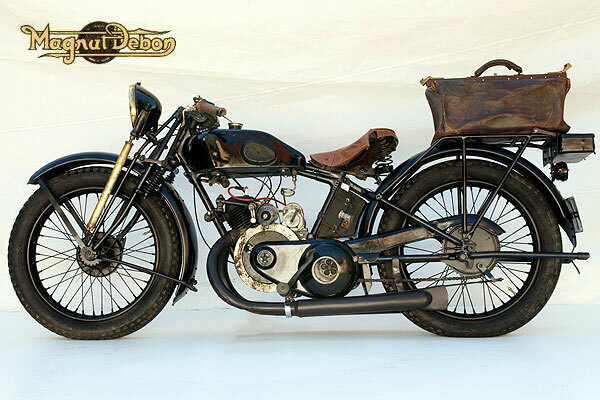 Then, in early 1908, Norton produced its own single cylinder side-valve engine. From 1937 – 1945, almost a quarter of all military motorcycles in Great Britain were made by Norton - mainly the WD16H (solo). A British high quality sports motorcycle. This motorcycle was assembled in Riga, Latvia, at Paul Romans’ workshop and was designated “for urban use.” Compared with the model’s military version, its engine has higher compression, simplified frame construction, narrower splash guards, and chrome coated gasoline tank. This specimen was purchased from the assembley shop of Paul Romans at 14 Elizabetes street, in Riga, where the motorcycles were assembled on order, from parts purchased in Great Britain. 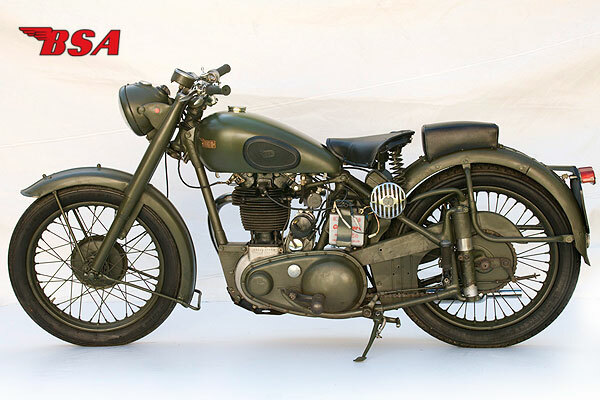 During WWII, Allied Forces were supplied with more than 120,000 BSA motorcycles because of their simplicity and easy maintenance. That is why during the post WWII period this model remained largely in military use. 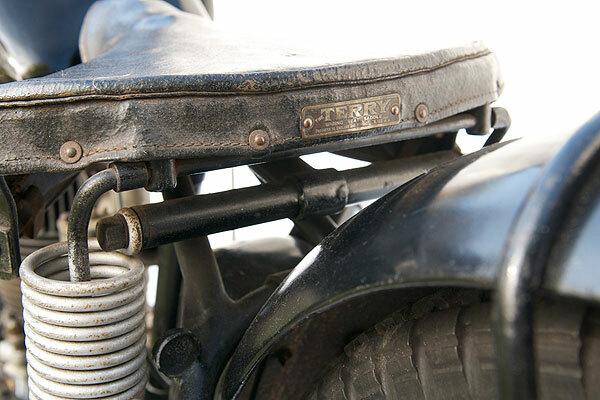 This particular motorcycle was purchased in 1961 from the French Law Enforcement Administration. 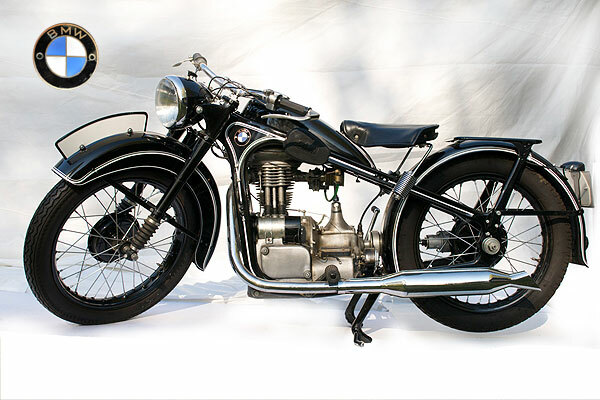 The BMW R35 was the most successful among the BMW models. From 1940 on, it has been popular with the police and the military. Its drive-shaft is completely encased, protected from dirt, and the riders’ clothing never gets soiled by oil. These advantages have made it the choice of rural residents who trail largely on the roads of the countryside. 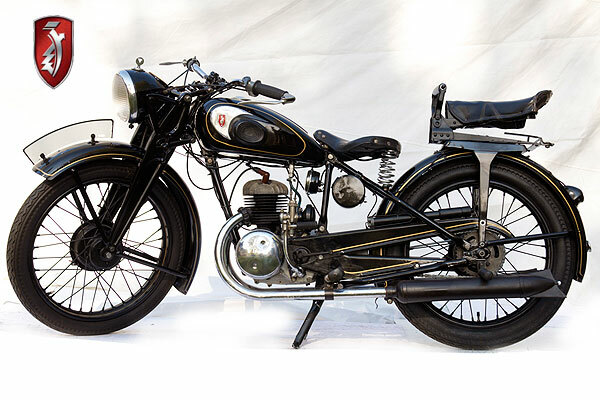 The history of the motorcycle “IŽ” finds its beginnings in 1928. 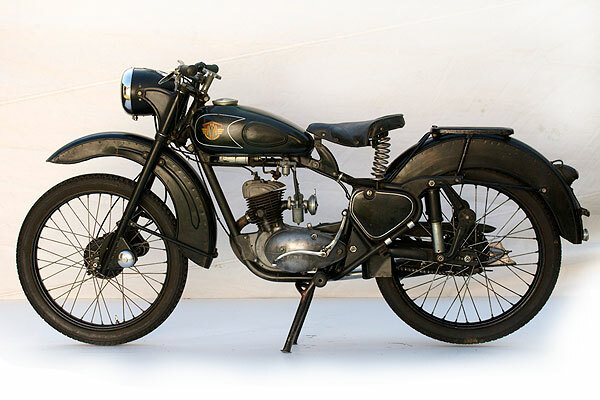 The German “DKW- NZ350” served as the prototype for “IŽ-49,” including the improvements of the earlier “IŽ-350.” The new model has several constructive innovations. Owing to advances in the spare parts technology, it had a new telescopic front shock-absorbing fork, rear wheel suspension, and inertia air filter. 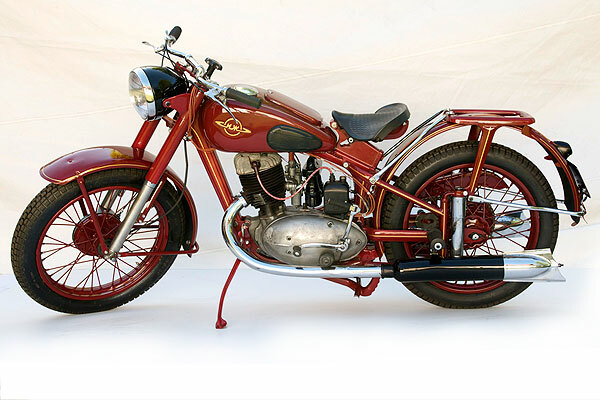 This was the most popular Soviet era motorcycle of the 1950’s, known for its simple design and dependability. 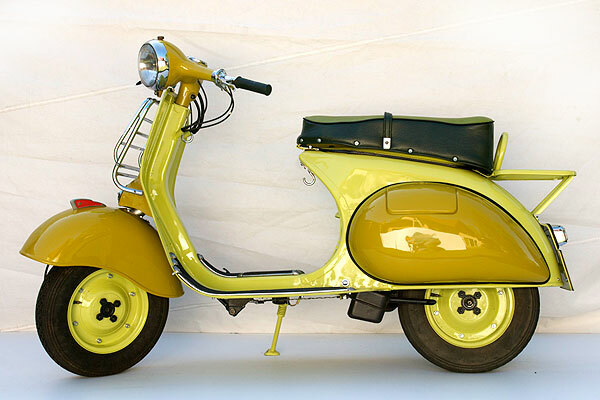 The manufacture of the VP150 was based on the Italian-made scooter, Vespa CS150. It was a very popular Soviet era (1960’s) vehicle, particularly with women. One could ride it in a skirt, it was clean, and the wide splash-guards protected the rider well from rain and mud. It cost Rbl 320.-, in comparison with the ZAZ965 – Rbl 1,800.-, Kovrovec - Rbl 125 - 456.-, or Minsk - Rbl 105-350.-. 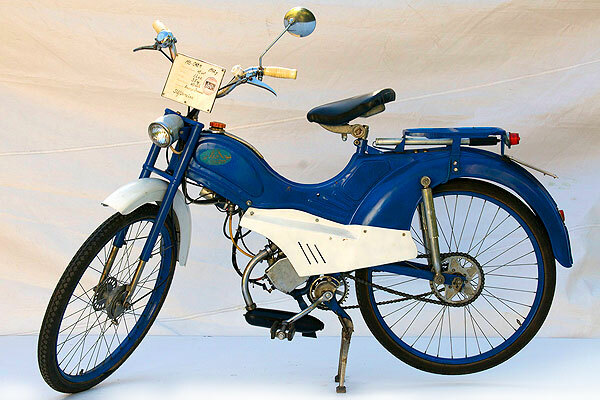 This was one of the first mopeds (moto-bicycles) manufactured by the Riga engine plant, “Red Star,” powered by, at the time, a very popular D motor series D-1 engine. 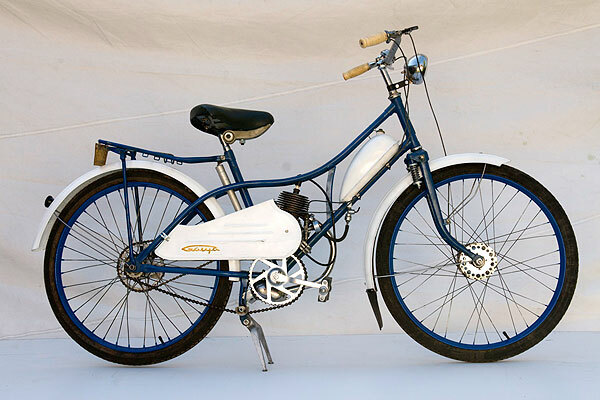 This moped (moto-bicycle) with D-2 series 45 ccm engine was manufactured in Ukraine. 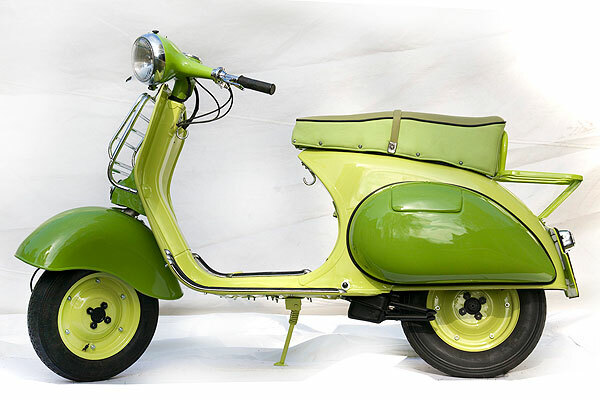 This scooter’s production began in the USSR in 1957. It was a copy of the, then popular, German Goggo-roller, TA200. Powered by an 8 hp, 199 ccm two-cycle engine, it has the maximum speed of 80 km/h, weighs 155 kg, and is equipped with a starter and a spare tire. Also, using the same chassis, the Tula plant produced a three-wheeled delivery vehicle. 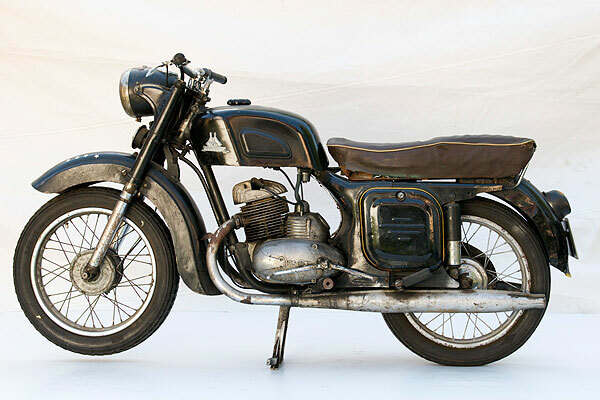 The K-175 (“Kovrovec”) series motorcycle was produced from 1957-1965. It had one cylinder two-cycle engine, with a cast-iron cylinder of 173.3 ccm displacement. The motorcycle had 16 inch weels (tire size: 3.25-16), complete chain housing, and a pillow- shaped seat for two. The K-175 is equipped with an 8 to 9.5 hp engine, has maximum speed of 80-85 km/h and weighs105 kg. 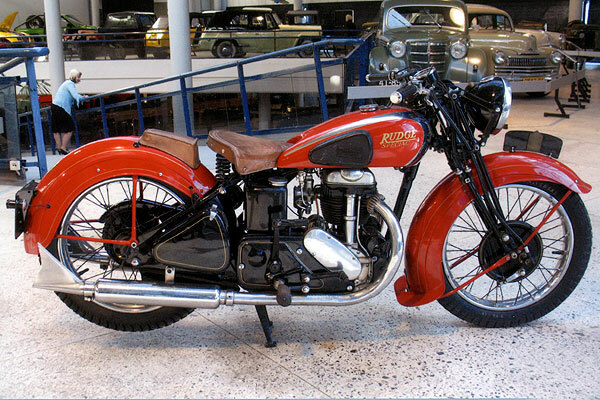 The new version of “Peraka” was released in 1945; it had a two-cylinder 350 ccm engine. 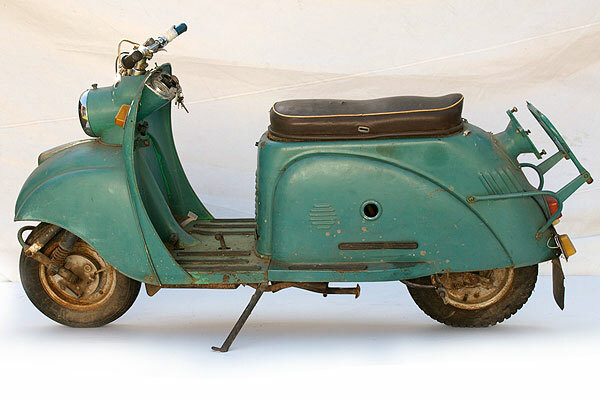 In 1953, the whole spectrum of (JAWA) models underwent considerable modernization, with introduction of independent suspension, sealed chain cover, and two-seat saddle. This was the type of JAWA one would be likely to encounter here, during the Soviet era. 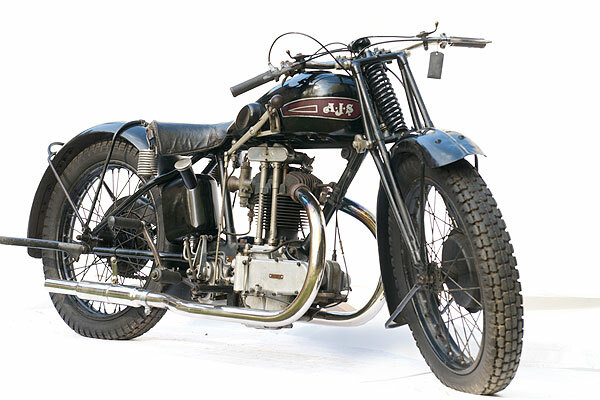 The JAWA brand became know across the globe, for these motorcycles were exported to 112 countries. 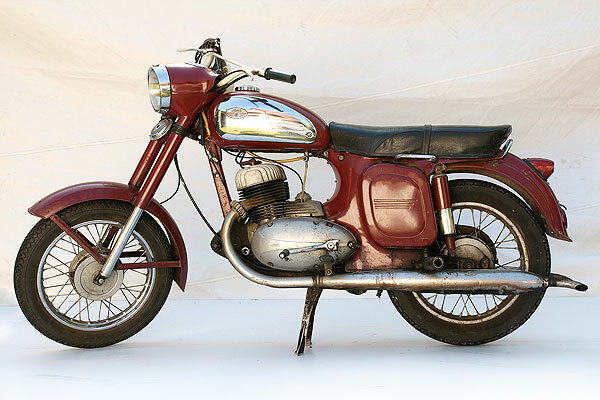 The JAWA motorcycles emerged in the Soviet Union in the mid of 1950’s.